Electric storms throughout the morning which brought persistent, heavy rain as well as the threat of lightning ensured that the free practice three session for Moto3 was cancelled. 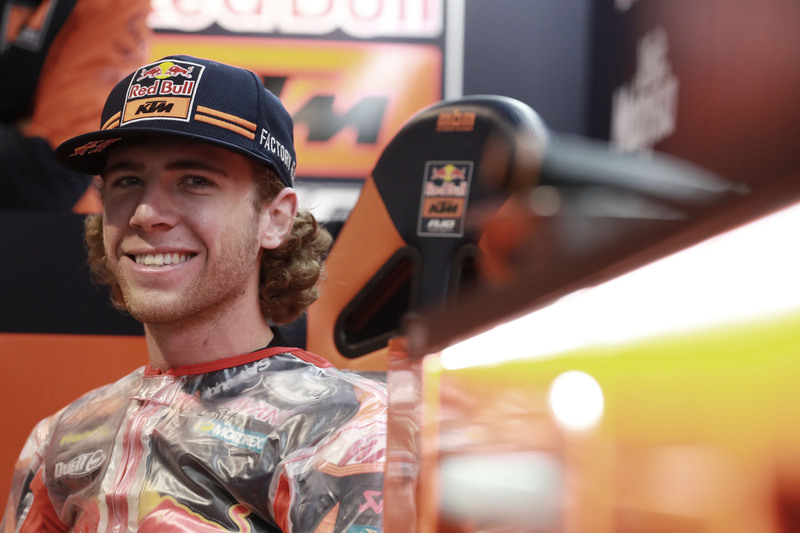 This meant that when the riders went out for qualifying just after noon, it was their first experience of the Circuit of the Americas in wet conditions. The first session was of course Q1, from which Argentina podium finisher Darryn Binder (CIP Green Power), Argentina winner Jaume Masia (Bester Capital Dubai), reigning Junior World Champion Raul Fernandez (Sama Qatar Angel Nieto Team) and regular podium contender Marcos Ramirez (Leopard Racing) advanced to Q2 for the pole position shootout. Having had an extra fifteen minutes of wet weather experience compared to the complete lack of such experience of the fourteen riders they would join in Q2, Q1’s top four were well-placed to take advantage and make a charge for pole position. 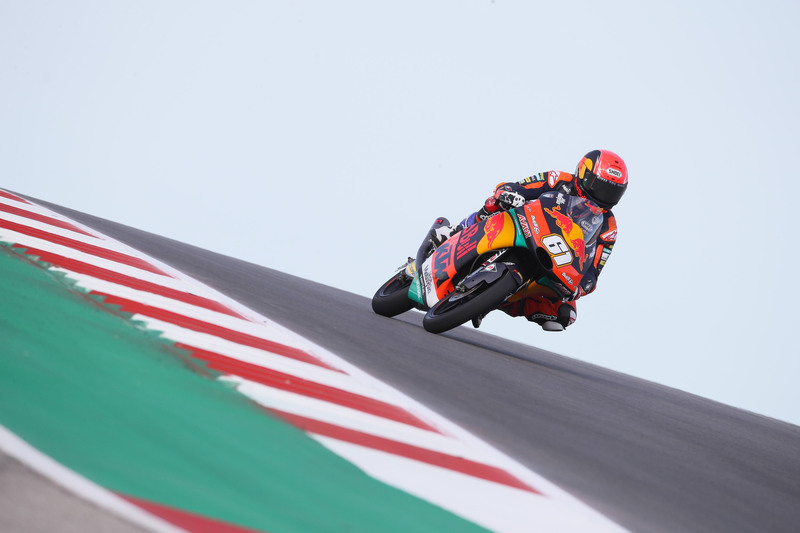 This was especially the case for Darryn Binder, who had at times been two or three seconds faster than his competitors in Q1, and ended up half a second clear of the field in the first session. However, it was finally Niccolo Antonelli (SIC58 Squadra Corse) who took pole position, his first of the season and, in fact, his first since his debut with Paolo Simoncelli’s team back in the opening round of the 2018 season in Qatar. Taking pole by half a second on his penultimate lap of the session, it was an impressive performance by Antonelli, and one he will hope to repeat in the race. Second fastest was Raul Fernandez, the fastest of those promoted from Q1. This is Fernandez’ debut pole, and he showed his emotion at that quite clearly after he crossed the line. Perhaps this was also because his final lap was not a simple one, as he encountered some traffic in the final sector – Ayumu Sasaki (Petronas SRT) and Tony Arbolino (VNE Snipers) being the obstacles in the Spaniard’s way. Two weeks on from missing out on a home GP podium in the final corner, Gabriel Rodrigo (Kommerling Gresini Moto3) took third place, seven tenths from Antonelli’s pole time. Jaume Masia set a fast lap late on in the session to take fourth and head up the second row of tomorrow’s grid, with Darryn Binder and Aron Canet (Sterilgarda Max Racing Team) – who crashed mid-way through the session – joining him on row two. Tatsuki Suzuki – teammate to the pole sitter – made the seventh fastest time, and will line up with John McPhee (Petronas SRT) and Alonso Lopez (Estrella Galicia 0,0) on row three tomorrow. The two Leopard Racing Hondas of Marcos Ramirez and Lorenzo Dalla Porta – who crashed late on – are joined by two-time COTA winner Romano Fenati (VNE Snipers) on row four; whilst the Italian duo of Andrea Migno (Bester Capital Dubai) and Dennis Foggia (Sky Racing Team VR46) are joined on row five by Jakub Kornfeil (Redox PruestelGP); and Ayumu Sasaki, Tony Arbolino and Kazuki Masaki (BOE Skull Rider Mugen Race) will line up on row six. Ai Ogura (Honda Team Asia) was the fastest of those not to progress through Q1 and will start nineteenth tomorrow, with Can Oncu (Red Bull KTM Ajo) and Celestino Vietti (Sky Racing Team VR46) making it an all-rookie affair on row seven tomorrow; whilst row eight will see Makar Yurchenko (BOE Skull Rider Mugen Race) line up ahead of Tom Booth-Amos (CIP Green Power) and round one winner Kaito Toba (Honda Team Asia). Sergio Garcia (Estrella Galicia 0,0) will line up for the first time in a Grand Prix tomorrow, starting twenty-fifth, with Riccardo Rossi (Kommerling Gresini Moto3) and Albert Arenas’ replacement Aleix Viu (Sama Qatar Angel Nieto Team) ensuring that row nine is as row seven – consisting entirely of rookies. The final row on tomorrow’s grid will be two-thirds full, with Filip Salac (Redox PruestelGP) ahead of Vicente Perez (Reale Avintia Arizona 77) who crashed very early on in Q1, and was taken to the medical centre.